Being home alone over the weekend, means that I get to cook meals that cater to my tastes exclusively, this is one of those recipes I have wanted to try for a while now. Roasted Beet and Rocket Salad from The Free Range Cook by Annabel Langbein. I have to admit, I am still using her books a lot, but at least I am trying out new recipes. This salad used freshly pulled beetroot from my garden, it was meant to have almonds, but I only had walnuts in the pantry. A drizzle of raspberry vinaigrette finished it off. Verdict: Absolutely delicious, the earthiness of the caramelised beets, combined with creamy salty feta and walnuts, was a beautiful combination, In fact I liked it so much I had it for lunch the next day too. Biscuits this week from Pearls from Jo Seager's Kitchen. Chocolate Chunk Oat biscuits. Recipe also available here. Verdict: I probably could have doubled the amount of chipotle sauce, but it still tasted good. Because it was such a large cut of meat, we had a lot of leftovers, so there have been pulled pork sandwiches, pulled pork nachos, and even some frozen away for another meal. Everyone enjoyed it, but we are a little sick of pork now. I was recently given a jar of preserved lemons, so thought I should find a recipe that used them. I remembered that hidden on my book shelf was an Australian Women's Weekly Moroccan Cookbook, where I found two recipes to try. Lemony Chicken Kebabs - chicken marinated in a beautifully fragrant lemon, herb and spice mixture, that kept the meat tender, moist and very flavoursome. Sweet and spicy vegetable tagine -lots of root vegetables and spices - which I cooked in a stove top casserole dish. Verdict: Served with couscous and greek yoghurt mixed with some reserved marinade, this was a delicious meal. The kebabs will definitely feature again on the must make list. The left over tagine was turned into a yummy warming soup with the addition of a can of chick peas and Moroccan flavoured tomatoes. Now lets see what May will have me trying. The feather pillow - it is finished ready to be gifted to Miss B. I wanted to convey the impression of feathers on sand, so I used an oyster shot cotton from Spotlight as the background. There is a tiny inner border of denim shot cotton and then the outer border is another AMH Skipping Stones fabric - Palm Fern in Bisque, I loved the soft sandy colourway of this, unfortunately it is not a colour that photographs well, so it is really hard to see the detail of the print. Straight line quilting on the border and, hand quilting with a variegated thread around the feathers finish the front. I used an exposed zip on the backing which is made from another favourite AMH feather print of which I had just enough fabric for. Binding from Tula Pink completed this pillow. That has been enough procraftinating from me, back to working on Mum's quilt now. The problem with new fabric is that it inspires you to start new projects, and not work on the ones you really need to get finsihed. eg: Mum's birthday quilt top. A few strips of fabric later, with some contrasting blues and aquas mixed in, a little cutting and sewing, I have three down sized AMH feathers. Two are going to be used in a pillow for her birthday, and the third, I'll keep to put in her sampler quilt. All going well there will be a pillow given to her soon, as long as I remember to measure twice and cut once - currently I am unpicking the border that is too short. Looking forward to seeing this finished in real life - cos in my mind it looks fabulous. It is School Holidays here at present, Miss B, Mr J and I are enjoying the lazy mornings,especially being able to stay in bed a little longer on these cooler autumn mornings. I have a lovely pile of quilt books and a new Annabel Langbein winter cookbook which are very inspiring. A long waited for novel, a new magazine in the post, I can see many more lazy holiday mornings. A new sampler block quilt. My sewing group has decided to do a block a month project where one member chooses a block for the group to make each month. Mel has chosen the Sugar Loaf and Raspberry Kiss blocks designed by Rachel (Woodenspoon Quilts) for our first one. It will be really interesting seeing the same blocks made up but in all the different fabrics and colour palettes we have chosen to work with. Mine is going to be for Miss B, and she is very keen on a sea blue/beach glass/pebbles and driftwood palette. Definitely not my usual colour palette to sew with, so we have set up a joint pinterest board for inspiration and to keep me on track. I am thinking those new AMH prints work in perfectly here too. The EPP cartwheel pillow is finally finished and has now been gifted. I made a simple envelope enclosure for the back and edged it with the same Tula Pink fabric I used in the front. Hope you all have a fabulous week ahead. Seeing as I wasn't rostered for work yesterday, and I couldn't really be bothered doing anything to strenuous in the housework department, I decided that I may as well start quilting the cartwheel pillow. After glue basting, simple circles, traced around readily available templates, (different sized plates and mugs) were quilted with a beautiful fuschia colour Aurifil thread on top, basic white on the bottom. This is the first time I have machine quilted complete circles, I think there will definitely be more circular quilting in my future. It wasn't until I was looking at all the photos afterwards, that I realised I didn't use my walking foot for this, thankfully all went well with it. Now just the pillow back to make and attach, and then it will be ready to be gifted. Georgia, a a novel based on the life of artist Georgia O'Keeffe. The problem with reading novels about real people - artists, royals, horticulturalists etc, is that one invariably spends a lot of time on the internet looking at the portraits, buildings, plants and other such things mentioned in the novels. Luckily my library had an art book on Georgia O'Keeffe showing her paintings, her home and some of the many portraits taken by her lover, Alfred Stieglitz,so I am able to have a companion book with the novel. EPP Cartwheel, - I can actually say it is finished - it just needs a good starch and press, some quilting and then it can be turned into a pillow. NO, this beautiful pillow is not my work. 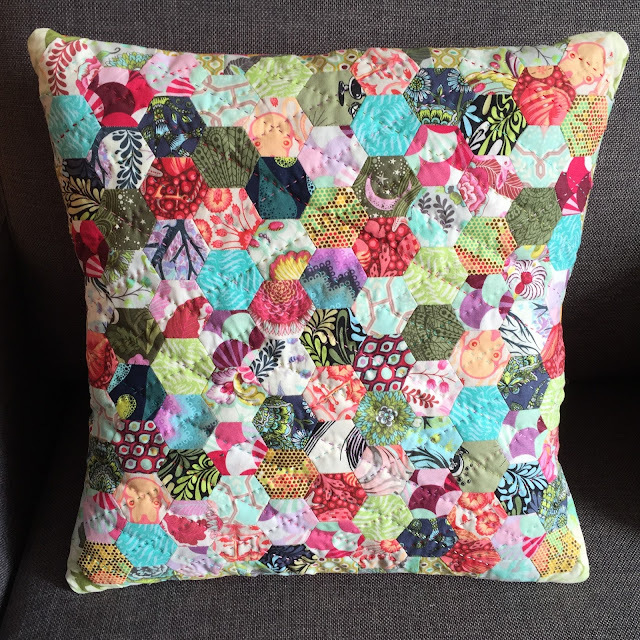 However I have been very inspired by this Tula Pink Hexi pillow made by my friend Susan, and have decided that my next EPP project will be an Anna Maria Horner Hexi pillow. The templates have been pulled out, as have the pre-cut 2.5" squares I have on hand. I see a lot more cutting of these in my future, luckily I have a very healthy AMH stash to support this. Of course, I need to finish up the EPP Cartwheel pillow first. Last night while watching Outlander, I made the final corner/edging pieces required for this and am now in the process of attaching them. So nice to know that the end is in sight for the cartwheel and a I have a new winter hand stitching project to look forward too.